To mark the centenary of ‘Votes for Women’ the Shell Heritage Art Collection will be highlighting female artists from our collection who have played strong, leading roles in their professions of commercial and fine art. These women helped to create change within their industry and society as a whole. The Representation of the People Act 1918 allowed some of the women of Great Britain and Ireland to vote for the first time. The act meant that women over the age of 30 could vote, but only if they were either a member, or married to a member of the Local Government Register, a property owner, or a graduate voting in a University constituency. 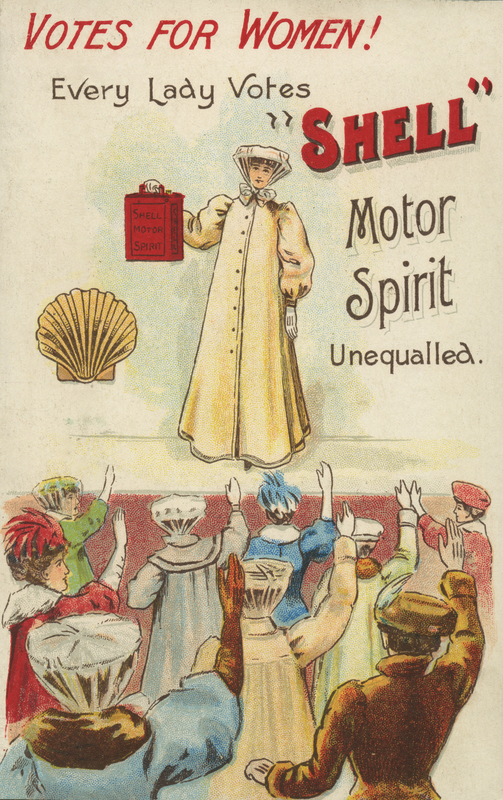 The 1928 Act widened suffrage by giving women electoral equality with men. It gave the vote to all women over 21 years old, regardless of property ownership. The call for the vote for women was led by a group of strong, inspiring women known as the Suffragettes. 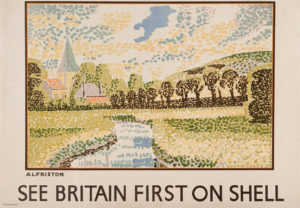 To celebrate International Womens Day 2018 we have selected the artist, interior designer and member of the Bloomsbury Group, Vanessa Bell who created the painting for the 1931 Shell poster titled ‘Alfriston’. Born in 1879 Vanessa Bell (nee Stephen) was educated at home, then attended Sir Arthur Cope‘s Art School in 1896. She went on to study painting at the Royal Academy from 1901-1904. After the death of her parents, Vanessa with her sister, Virginia (the writer Virginia Wolf), and brothers Thoby and Adrian moved to Bloomsbury in London. It was here that Vanessa met other intellectuals and creatives who set up the informal, but later famous, Bloomsbury Group. The group shared common values and a strong belief in the arts with artists, fiction and non-fiction writers and art critics as members. In 1907 Vanessa married fellow member Clive Bell and they went on to have two children together. 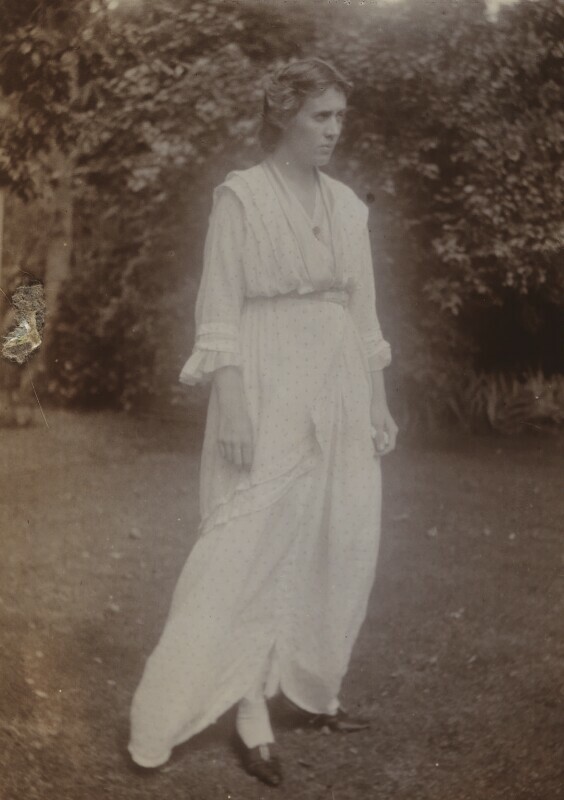 By 1916 Vanessa and Clive’s marriage had turned in to a friendship and in 1918 Vanessa gave birth to a daughter by Duncan Grant. In 1912 Vanessa exhibited her paintings at the Grafton Galleries landmark show alongside works by Picasso and Matisse. Her first solo show was at the Omega Workshops in 1916 and another in 1922 at London’s Independent Gallery. Her work was exhibited internationally in London, Paris, Zurich and Venice. The Omega Workshop was opened as an artists’ cooperative for decorative arts founded in 1913 by Roger Fry, Vanessa Bell, and Duncan Grant, all Bloomsbury Group members. The aim was to remove barriers between the decorative and fine arts and enable fine artists an opportunity to earn an income from other creative work. This is shown in Vanessa’s work for Shell. Shortly before the outbreak of the First World War Vanesa Bell, Clive Bell and their children moved to Charleston Farmhouse in East Sussex where they continued to work on commissions together for the Omega Workshop. Grant and Bell together produced interior schemes including rugs, printed furnishings, decorated tableware and embroidery designs executed by Vanessa, Mary Hogarth and Mrs Bartle Grant. Charleston Farmhouse became a centre for artists and creative people and was decorated throughout by Bell and her companions. The house has been preserved in this state and can still be visited to see and learn about the effect that Vanessa Bell and the Bloomsbury Group had on art in the early twentieth century. Vanessa Bell, and her partner Duncan Grant, were commissioned in 1932 to produce a dinner service for the British art historian, museum director, and broadcaster Kenneth Clark. With much input from Clark’s wife Jane, they produced the ‘Famous Women Dinner Service’. This comprised 50 plates painted with portraits of famous women through the ages. This work, which was believed lost until 2017, but was recently displayed for the first time as part of a larger exhibition in April 2018 at Piano Nobile Gallery, London ‘Vanessa Bell and Duncan Grant: The Post-Impressionist Years’.